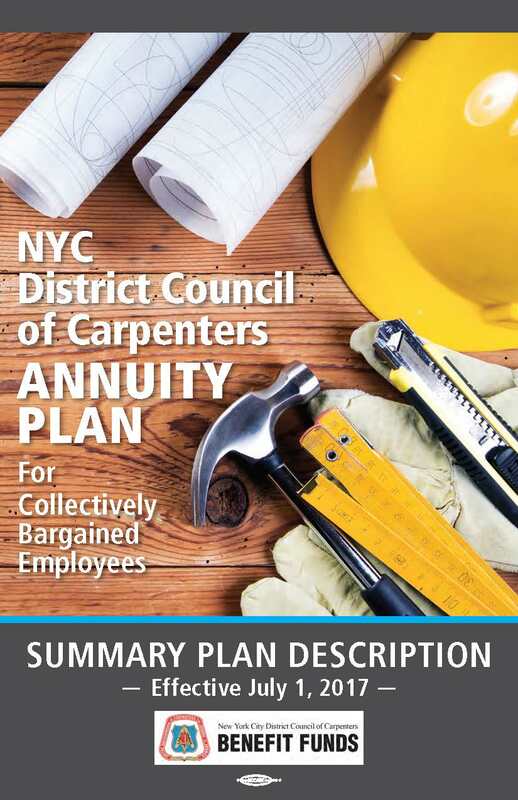 The New York City District Council of Carpenters Annuity Plan was established by trust agreement through the collective bargaining between the New York City District Council of Carpenters of the United Brotherhood of Carpenters and Joiners of America, and various employers. The Annuity Plan provides for your retirement security by permitting your Contributing Employers to make contributions to the Plan on your behalf. Because the Plan is qualified by the Internal Revenue Service, special tax rules allow you to save more dollars for your retirement. Your savings are held for you in your individual Account until they are distributed as provided under the Plan. What happens if I cannot make the loan payments? If you do not make any payment before the end of the calendar quarter following the quarter in which the payment was due, your loan will default. If this happens, the full loan amount will be due and payable immediately. If you are in danger of defaulting on a loan, please contact Prudential immediately. What if I terminate employment while I have an outstanding loan? If you terminate employment with an outstanding loan balance, you may repay the loan in full or continue to make repayments by check. You may prepay your loan balance, at any time, without penalty. When you repay the loan, both the principal and the interest will be reinvested in your account. Do I pay interest on the loan? Yes. The interest you pay goes back into your account. In other words, you pay yourself the interest. How long may I take to repay the loan? You may take up to five years to repay a general purpose loan, in equal quarterly installments. If you are using the loan to purchase your primary residence, you may borrow for up to a 10-year period. How much can I borrow from my account? The minimum amount you can borrow is $500. The maximum amount you can borrow is the lesser of (1) 50% of your vested account balance or (2) $50,000 minus the highest outstanding balance of your total Plan loans during the last 12 months. Access your loan account online at www.prudential.com/online/retirement or call Prudential Retirement @ 877-PRU-2100. How do I make payments on the loan? If you are working under a collective bargaining agreement, you will receive a loan bill before the due date of each quarterly payment. You must repay the loan using a personal check or money order. If you are an Employee of the Benefit Funds or the District Council, you must repay the loan through payroll deduction. Who is eligible to take a loan? To apply for a loan, you must be a participant in the Plan and you may not already have three outstanding loans. In addition, you must not have defaulted on a loan within the last five (5) years of applying for a new loan. If you previously defaulted on a loan, you must repay the loan or be eligible for an offset.